June 17th was the last decent shot at severe weather during my week off. 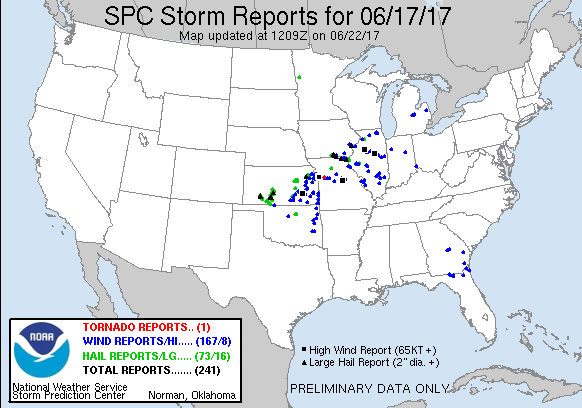 A large MCS from the prior day storms traveled overnight across southeastern Nebraska and Missouri. 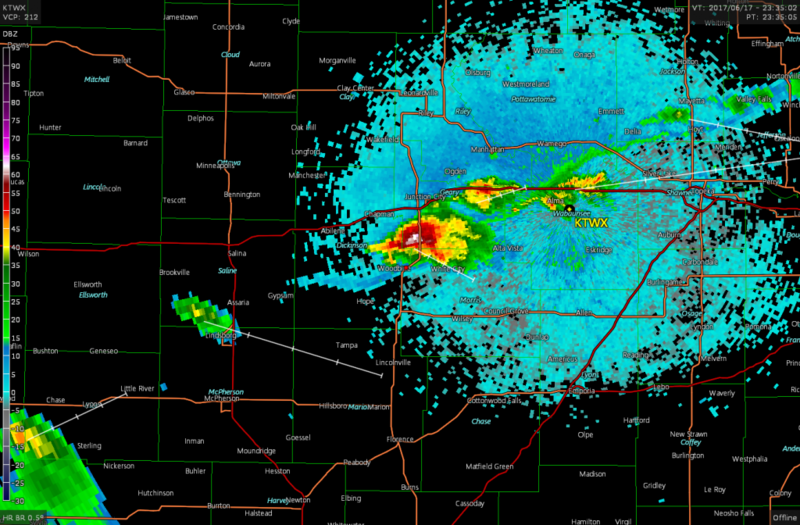 This complex left an outflow boundary which arced from Beatrice, NE to Kearney then southwest into Kansas and Oklahoma. Meanwhile a weak frontal zone was present from New Mexico through Kansas into Iowa. Either of these features would serve as the focus for storms later in the day, unfortunately that meant a zone stretching from western Kansas into the lower Great Lakes. The SPC outlook noted an area in Illinois that was not affected by the overnight MCS, however I wasn’t about to trek to Illinois for what would be a marginal tornado risk. I decided to stay closer to home and opted to play the frontal zone in northeastern Kansas, hoping to get a discrete storm to do something before upscale group generated a new MCS. I left Grand Island at 16z and spent the next three hour or so driving to Salina where I camped out to see what was going to unfold. 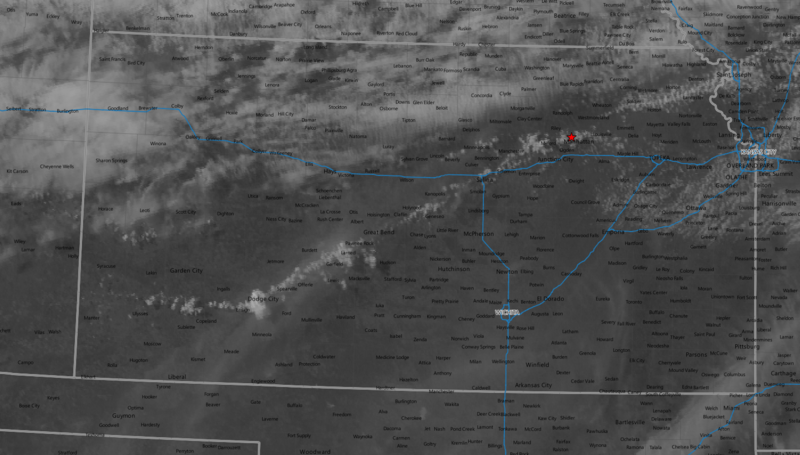 After 20z some cumulus began to percolate north of the I-70 corridor in northeastern Kansas and by 22z the frontal zone became apparent on satellite as a solid line of cumulus extending from Kansas City south-westward to Dodge City. By this time I had already begun to drift east on I-70 towards the Manhattan area as the boundary was showing up very strongly on the Topeka radar. It wouldn’t be for another hour until the severe thunderstorm watch was finally issued at 2310z as cells began to fire near Abilene. Within a half an hour the initial cell had grown into a rather nice supercell, especially on radar. The storm developed a nice hook on radar and for a minute while I was nearly directly under the meso it exhibited some rotation, that was about as good as it’d get. 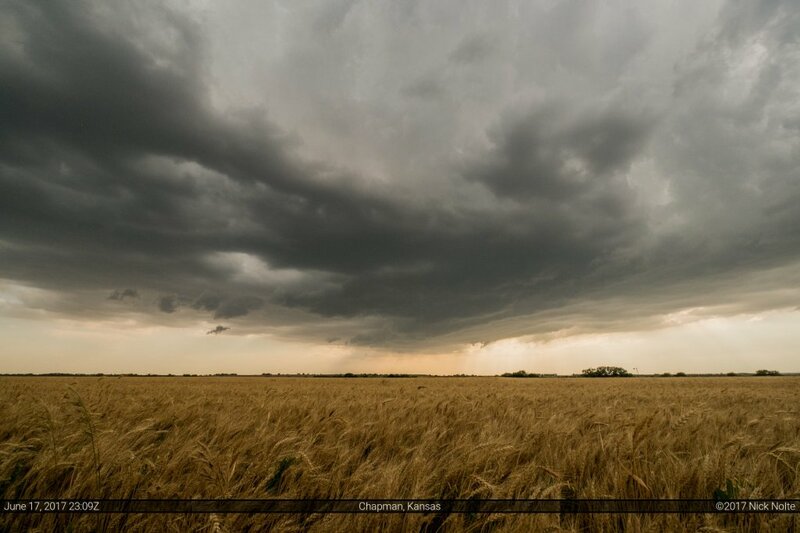 For the majority of the chase, these cells appeared to be well behind the boundary, so I wasn’t optimistic about any tornadic development, but I decided to keep with the storm to see what was in store. Eventually, the hook disappeared from the radar signature as it appeared the boundary was racing ahead of the storms as outflow, ending any shot at a tornado for the rest of the night. 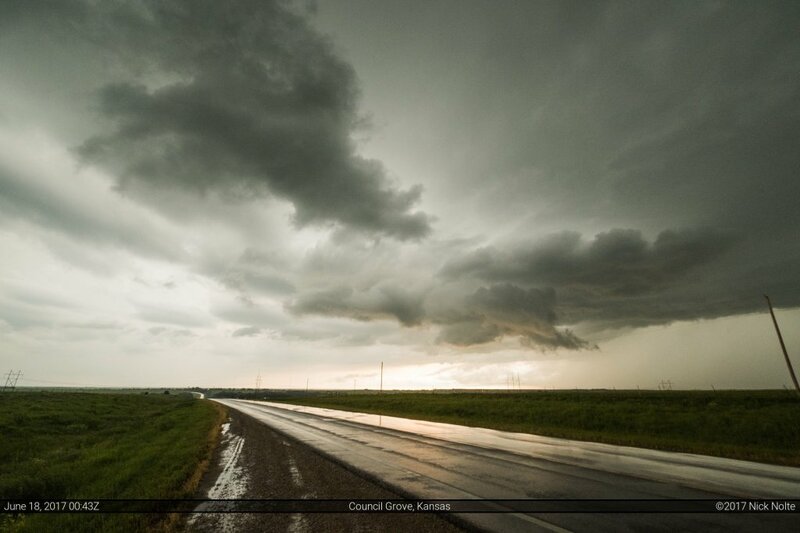 The meso on the storm I was chasing shriveled up as dusk settled in and I began to head back home shortly thereafter.